Unlike most plants, the peanut plant flowers above the ground, but fruits below ground. From planting to harvesting, the growing cycle of a peanut takes 4 to 5 months, depending on the type and variety. Many people are surprised to learn that peanuts do not grow on trees like pecans or walnuts. Peanuts are legumes, not tree nuts. USA peanuts are planted after the last frost in April through May, when soil temperatures reach 65°—70°F. Farmers plant specially grown and treated peanut kernels from the previous year’s crop about two inches deep, approximately one to two inches apart in rows. Pre-planting tillage ensures a rich, well-prepared seedbed. For a good crop, 120 to 140 frost free days are required. Peanut seedlings rise out of the soil about 10 days after planting. They grow into a green oval-leafed plant about 18 inches tall. Unlike most plants, the peanut plant flowers above the ground, but fruits below ground. Yellow flowers emerge around the lower portion of the plant about 40 days after planting. When the flowers pollinate themselves, the petals fall off as the peanut ovary begins to form. This budding ovary is called a “peg.” The peg enlarges and grows down and away from the plant forming a small stem which extends to the soil. The peanut embryo is in the tip of the peg, which penetrates the soil. The embryo turns horizontal to the soil surface and begins to mature taking the form of a peanut. The plant continues to grow and flower, eventually producing some 40 or more pods. From planting to harvesting, the growing cycle of a peanut takes 4 to 5 months, depending on the type and variety. Peanut plants need 1½ to 2 inches of water per week during kernel development. If rain does not meet those needs, farmers will irrigate the fields. Without adequate rainfall, non-irrigated peanuts begin to show drought stress. 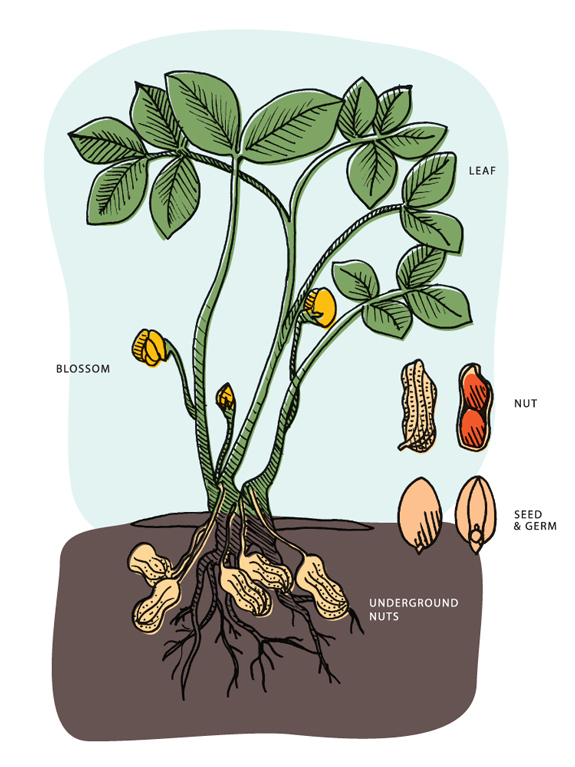 The peanut is a nitrogen-fixing plant; its roots form modules which absorb nitrogen from the air and provide enrichment and nutrition to the plant and soil. Harvest 120 to 160 Days After Planting. When the plant has matured and the peanuts are ready for harvest, the farmer waits until the soil is not too wet or too dry before digging. When conditions are right, he or she drives a digger up and down the green rows of peanut plants. The digger has long blades that run four to six inches under the ground. The plant is loosened and the tap root is severed. Just behind the blade, a shaker lifts the plant from the soil, gently shakes the direct from the peanuts, rotates the plant and lays the plant back down in a “windrow”—with peanuts up and leaves down. Peanuts contain 25 to 50 percent moisture when first dug and must be dried to 10 percent or less so they can be stored. They are usually left in windrows for two or three days to cure, or dry before being combined. Combining is the Last Step. After drying in the field, a combine separates the peanuts from the vines, placing the peanuts into a hopper on the top of the machine and depositing the vines back in the field. Freshly dug peanuts are then placed into peanut wagons for further curing with forced warm air circulating through the wagon. In this final stage, the moisture content is reduced to 10 percent for storage. The Florida Peanut Producers Association is a grower check-off association that represents the interests of Florida’s peanut producers through research, promotion and educational programs. COPYRIGHT 2014, FLORIDA PEANUT PRODUCERS, ALL RIGHTS RESERVED.